“Before New York was New York, it was New Amsterdam. Now the essence of the city has been distilled into the classic New York spirit”. Today’s review is courtesy of New Amsterdam gin, the gin which pays homage to the 17th century Dutch settlement which we now know as New York city. Unfortunately if you live in the area or are visiting, you might have a hard time finding the distillery because it’s actually based out of Modesto, California. Being a fan of gin, and a bigger fan of experimentation/innovation I have mixed feelings about this product. Aroma: First to hit the nose will be the hints of juniper that gins have come to be known for, however it’s quickly replaced by strong hints of citrus, very much like that of a citrus flavored vodka. Taste: Though gin connoisseurs will probably disagree, New Amsterdam gin actually has good flavor, and comes off very smooth. It’s hint of juniper and overload of citrus makes you almost forget it’s a gin your drinking which depending on the drinker can be good or bad. If you are looking for a gin to drink straight (not many of us left out there) or to mix in a martini this might not exactly be for you. The lack of gin familiarity that comes from heavy juniper will leaving you with something to be desired. However its unique taste does match perfectly with fruit based cocktails. The buzz of this gin is growing and rightfully so but trying to compare it to a Bombay Sapphire or Hendricks would be like comparing apples to oranges. At it’s economy friendly 12-15$ range however, its perfectly acceptable for daily consumption or while rationing your more traditional gins. Muddle strawberries with the basil until fully mashed, add all other ingredients, and shake with ice vigorously, strain into martini glass and garnish with half strawberry. Combine all ingredients except wedge in a chilled cocktail shaker and strain into a martini or highball glass and garnish with a wedge. Combine all ingredients except the soda in a shaker filled with ice, shake vigorously and strain over an ice-filled high ball glass OR as a martini, strain into a martini glass. Add soda last as a float. Garnish with a lemon wheel or top with lemon zest. Muddle the watermelon slices and combine all ingredients into a cocktail shaker. Add plenty of ice. Shake vigorously for eight seconds. Pour contents into a highball glass and garnish with a watermelon slice. 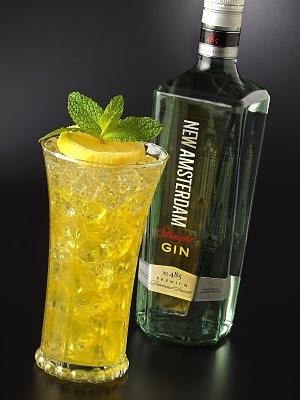 Photos and recipes courtesy of New Amsterdam Gin. As always we recommend you become a fan on Facebook to stay current on our latest reviews and recipes. Class Dismissed ! The year is almost over, and if you’re like me you plan on spending the last few hours of the year hosting family and/or friends reminiscing on all the good and bad that happened in 2010 all while enjoying the tingly taste of your favorite bubbly. But if you’re like me, you live to be different. So this year instead of the same old boring (good but boring) champagne, impress your friends and offer up some champagne cocktails. Traditionally, the mixing of champagne with anything might be blasphemous to some, but for true cocktail lovers, combining the sparkling spirit with your choice of ingredients can create some amazing flavors. Along with creating new flavors, additional ingredients can help create or enhance a night of romance that many envision when planning their New Years get together. Is saving more money one of your New Years resolutions? Serving Champagne cocktails can help you get a head start on that one as generally you can create these delicious concoctions with less expensive champagnes and/or sparkling wines that work just as well. With less than 24 hours until your party starts, lets stop wasting time, enjoy ! Fill a large goblet half full of cracked ice. Add lemon juice, curacao, and orange slice. 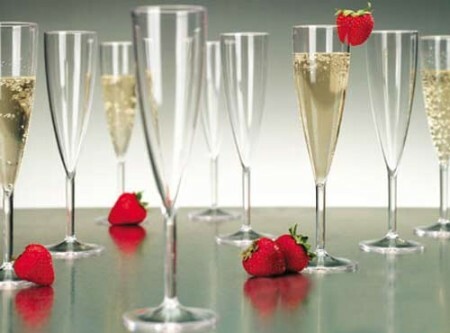 Stir and fill glass with champagne or sparkling wine. Stir again gently. Dip the rim of a chilled wine glass in lime juice, then salt. Pour in tequilla and Triple Sec, then fill with champagne or sparkling wine. Rim the edge of a wine glass with white or gold sugar. Pour well-chilled vodka into the glass,and fill with champagne or sparkling wine. As simple and classic as it gets, the mimosa is delicious and can be altered to fit your taste. Try this recipe, or half and half.